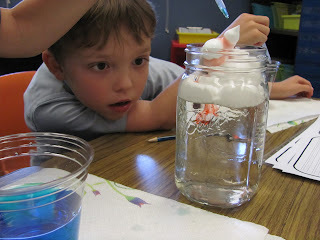 When we came back inside, we watched a Magic School Bus video on weather and the kids really enjoyed it. 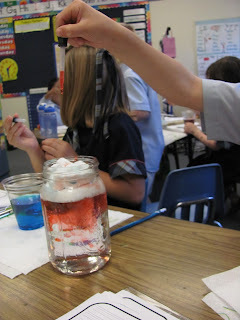 Then came the really fun part. 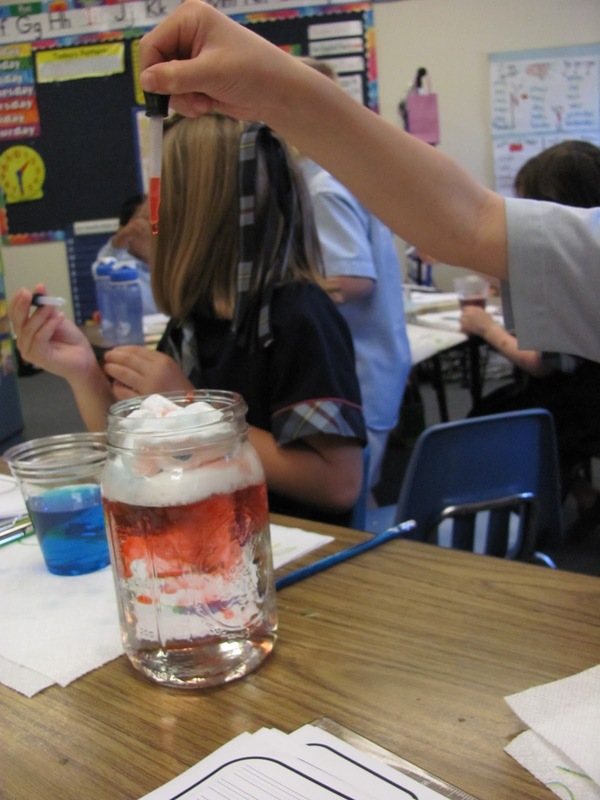 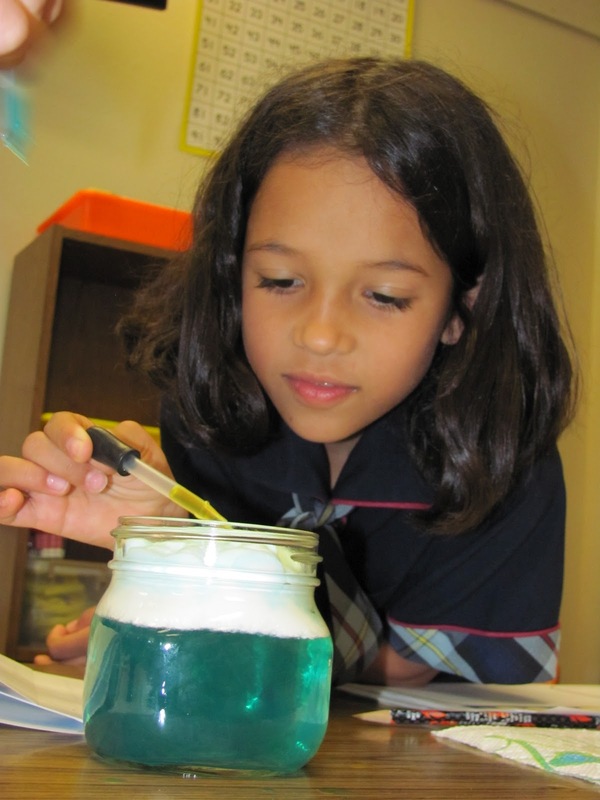 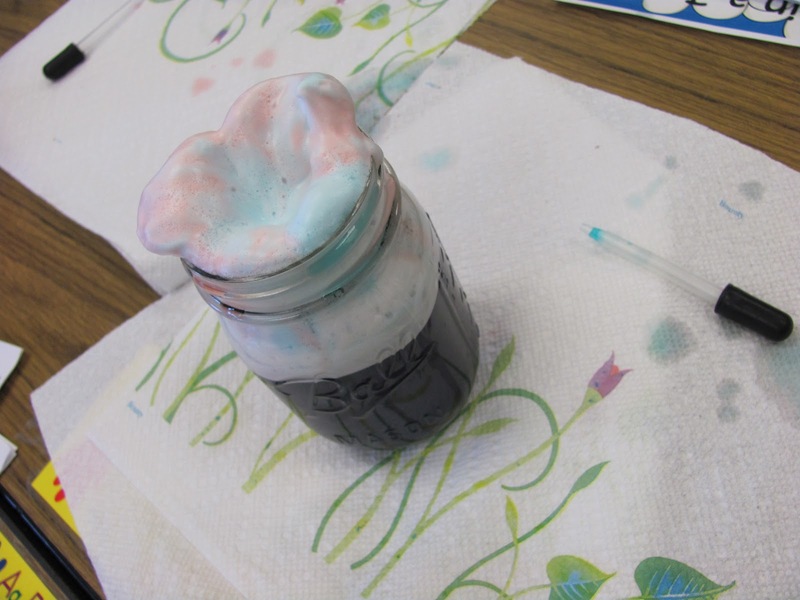 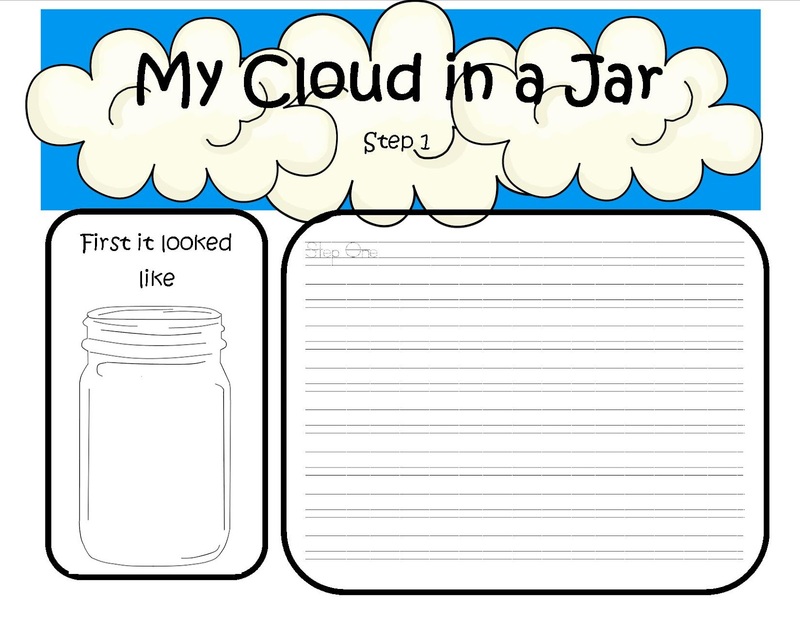 I found a fun activity on Pinterest about making a cloud in a jar and decided to try it out in my class. 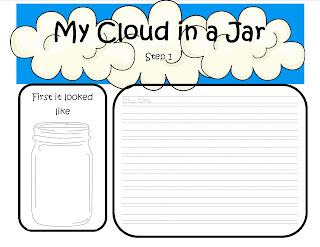 (http://www.teachpreschool.org/2012/03/clouds-in-jars-and-on-the-table-top-too/) I tell you what– it was a HUGE hit! The kids LOVED it. 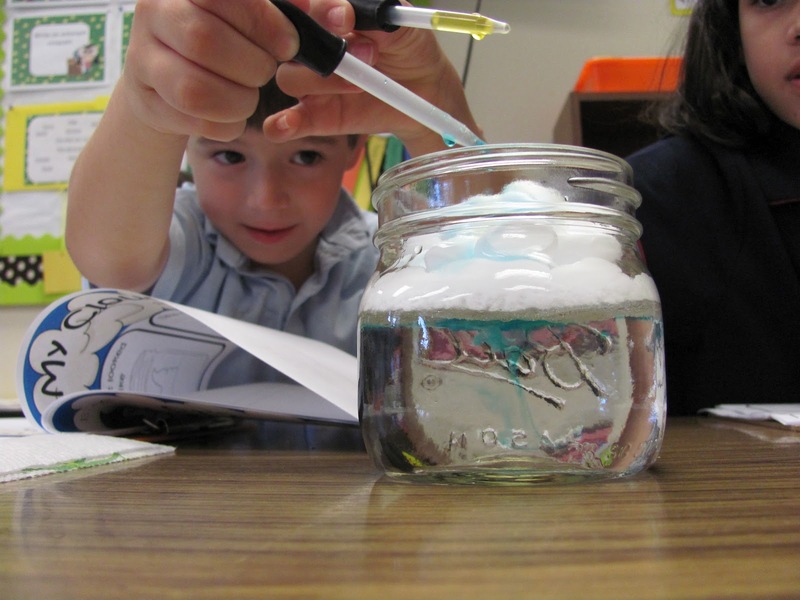 First we prepared the tables. 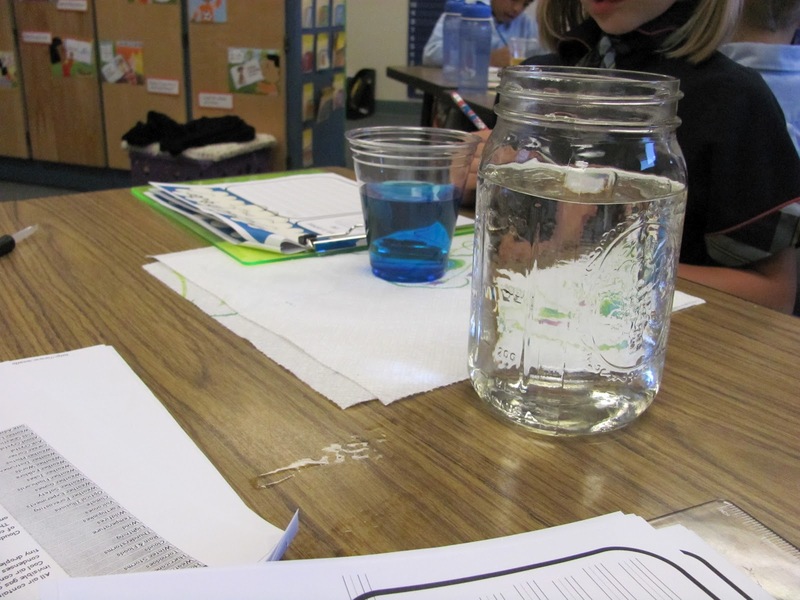 The kids in my class sit at tables that seat four kids. The elbow pairs each got a mason jar, two different colors of water and their own eye droppers. 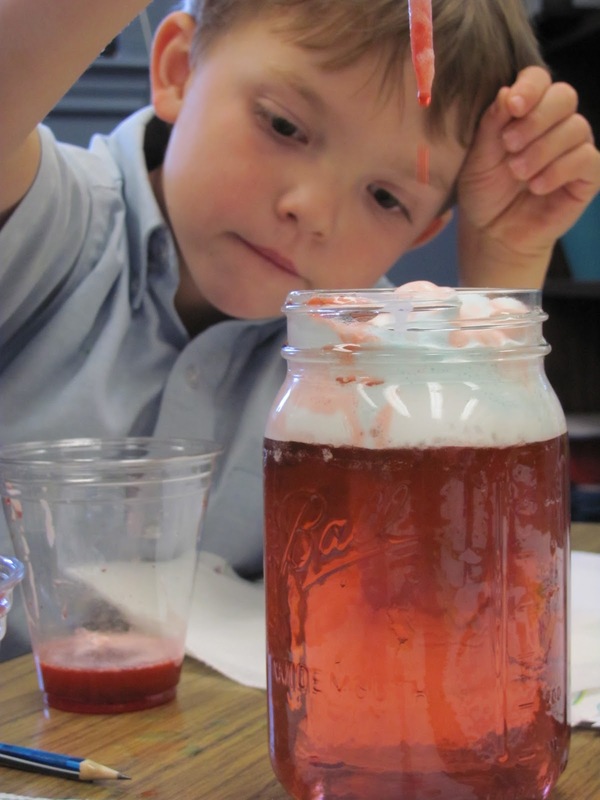 Then we went and added cumulus clouds (shaving cream) to every mason jar. 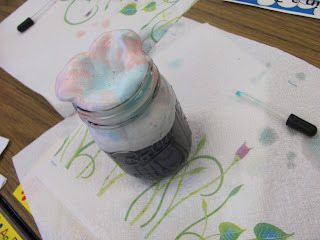 The kids then took turns dropping in water with food coloring on the top of their clouds. 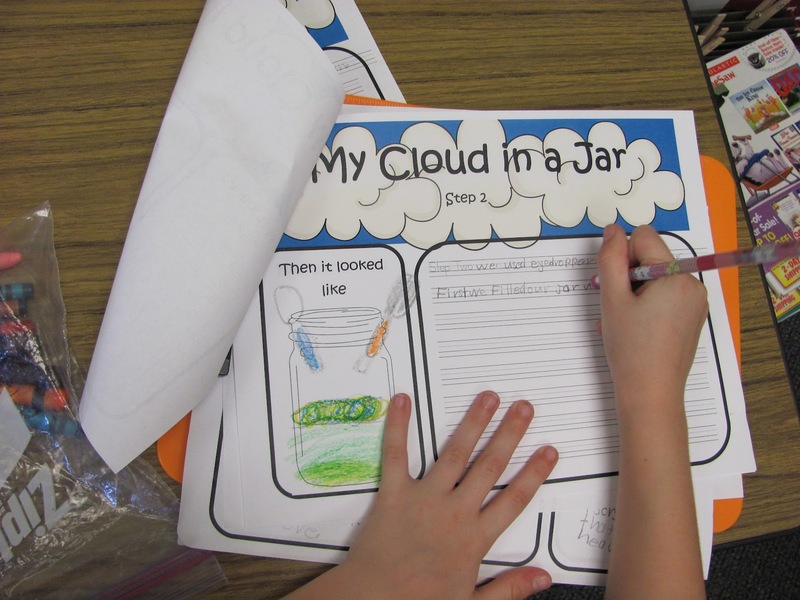 They made observations in their cloud books as the experiment progressed. 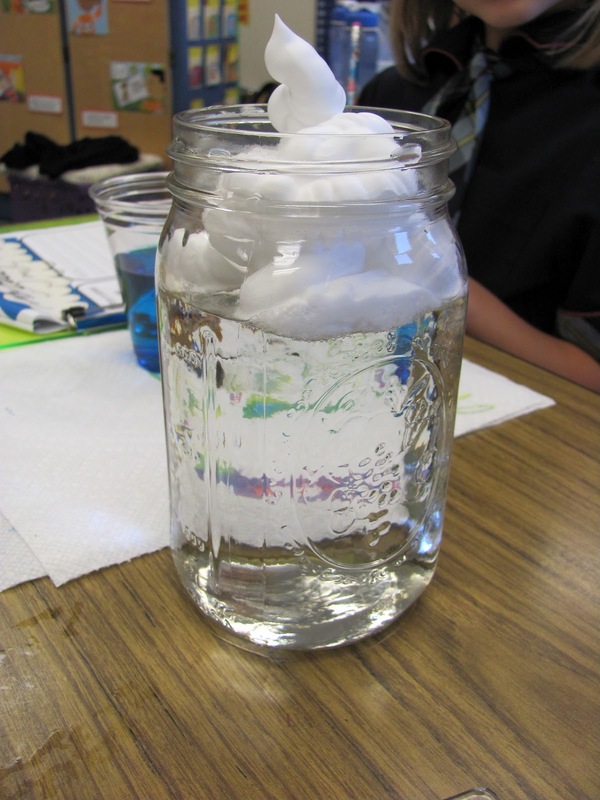 They loved watching as the water slowly dropped through the cloud and entered the water! 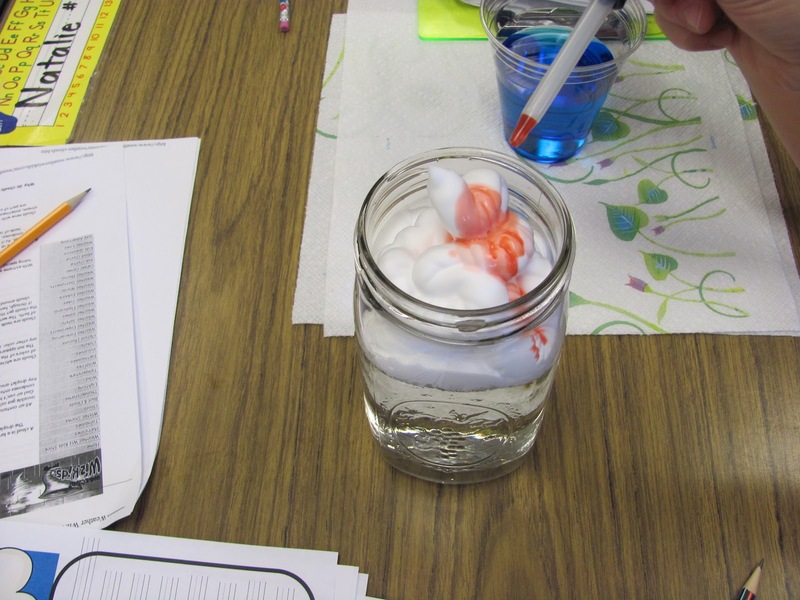 After about 15 minutes the water got dark but the kids still loved watching the color of the water change and they BEGGED to do it again. 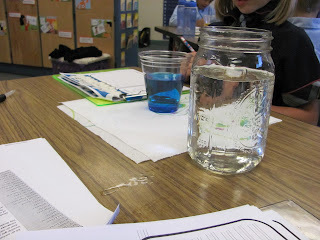 Unfortunately, we were running close to the end of the day so we had to clean up. 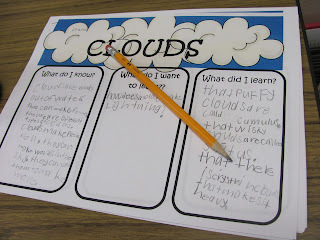 After we were all cleaned up, the kids wrote down their observations and the steps of the process. 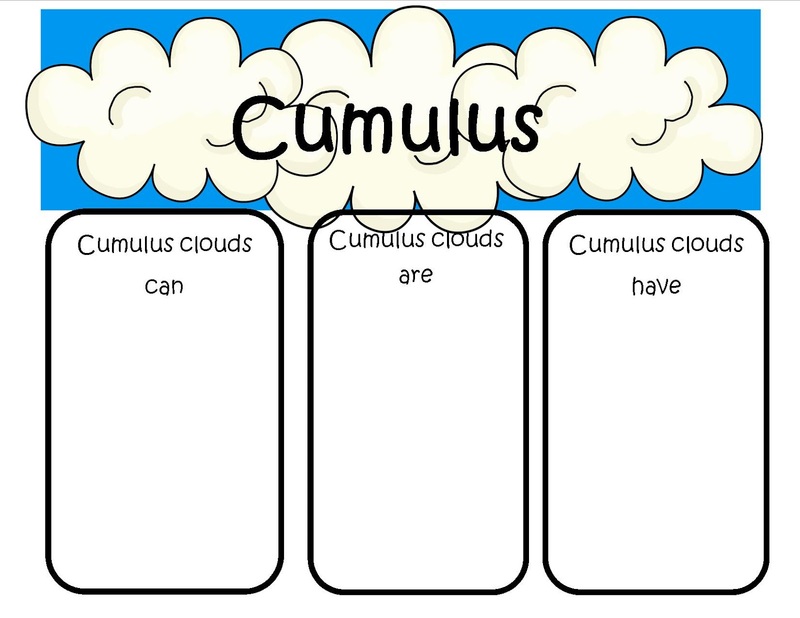 If you would like a copy of the Cloud Book you can get it here!It also includes Cumulus, Stratus, and Cirrus can, have, and are pages! 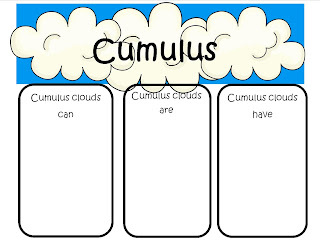 Today we are going to make our own Cumulus Clouds and Cirrus clouds. 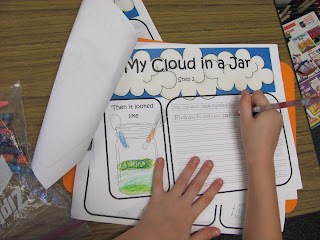 Afterwards we are going to write similies about our clouds!! 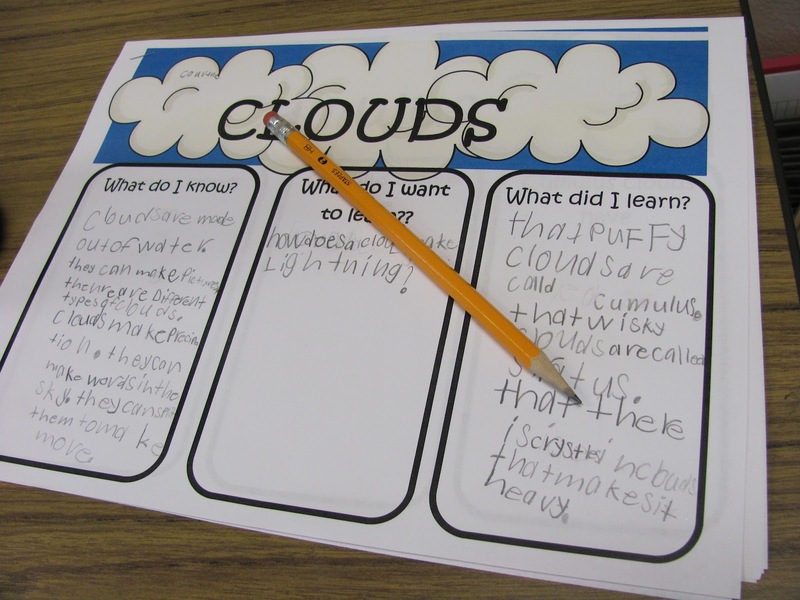 The kids are loving learning about clouds!